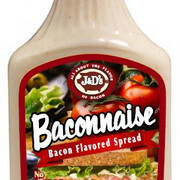 Baconnaise in a squeeze bottle! Make everything taste like bacon with Bacon Salt® and Bacon Rub. Make it hot! Try this on ribs and chicken. Candy your bacon! In Bourbon Pecan, Spicy Sriracha and Festivus! Holiday Spice flavors. 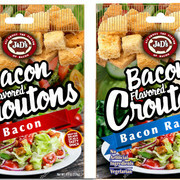 Croutons - usually the most boring part of the salad. Not anymore, with Bacon and Bacon Ranch!